Curious about what was going on in the depths of Miskatonic University, and eager for a juicy story, you have decided to investigate. This will be a tale like no other, and your editor will be very pleased – if you can make it out alive. 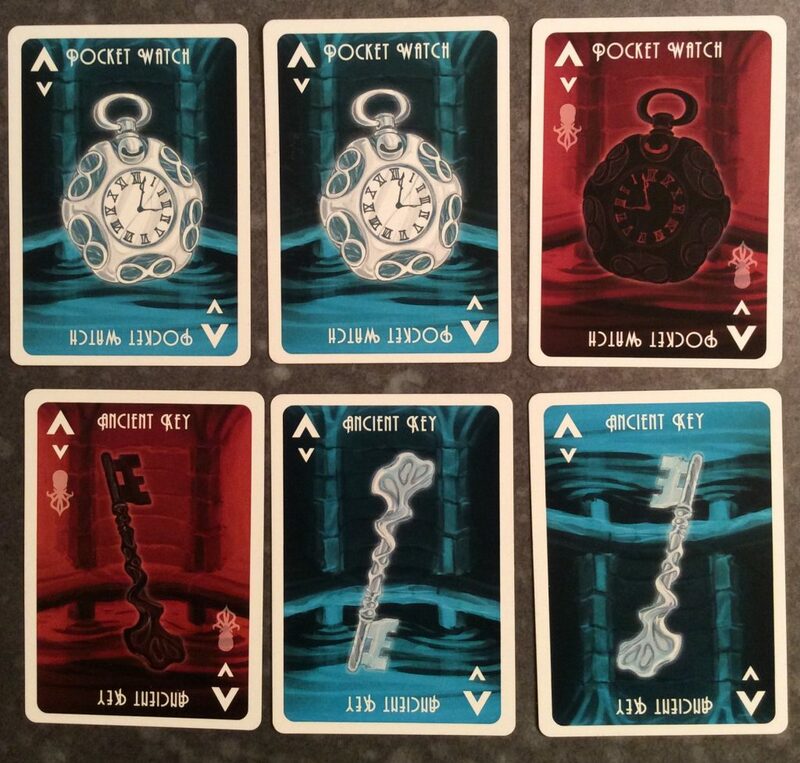 Arkham Ritual is a game of hidden information and bluffing, where you are trying to get the best result for yourself, while confusing and outwitting the other players. During the game you will always have one card in your hand, but you’ll never see it – not until the end of the round, at least. You can, however, see everyone else’s cards. So based on their cards and the cards that get discarded, you have to deduce what your card is, and whether or not you should keep it or chance taking a different one. You see, at the end of each round, if you are holding certain cards, you survive – holding others means that have lost some of your sanity and are closer to death. If you are the last one with any sanity left, you win. 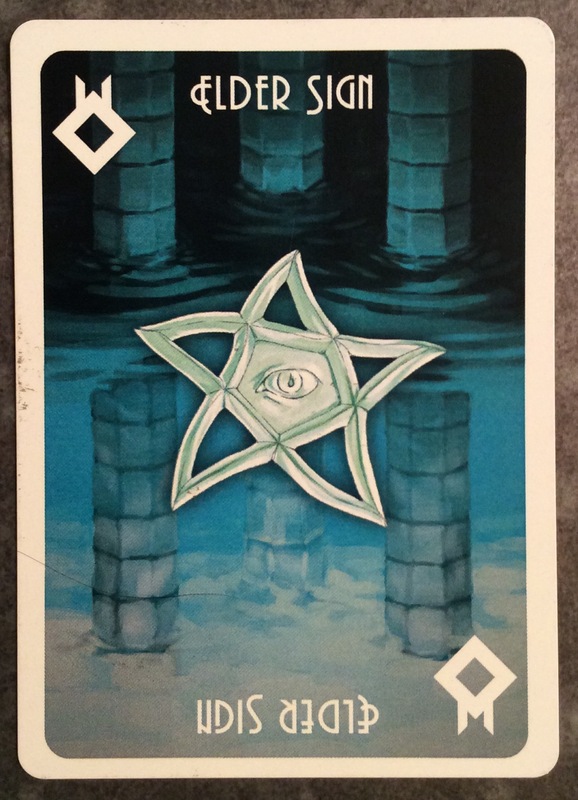 So basically you are trying to get other people to take the bad cards while you hope to deduce your own card and end up with a good one (one that doesn’t cause insanity). The cards: There are only 22 cards in the game. Blue cards. Blue cards are good. They represent objects that will not pry your sanity from your soul. Red Cards. Red cards are bad. These cards drive you insane. But, there are other things to consider. If you have the same object on your card as someone else (no matter the color) it’s also bad, and you lose sanity. 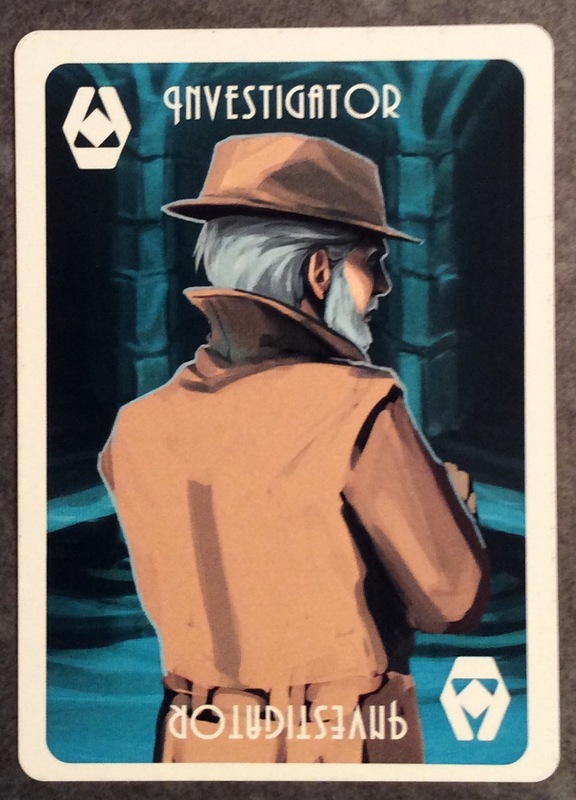 Investigator card. 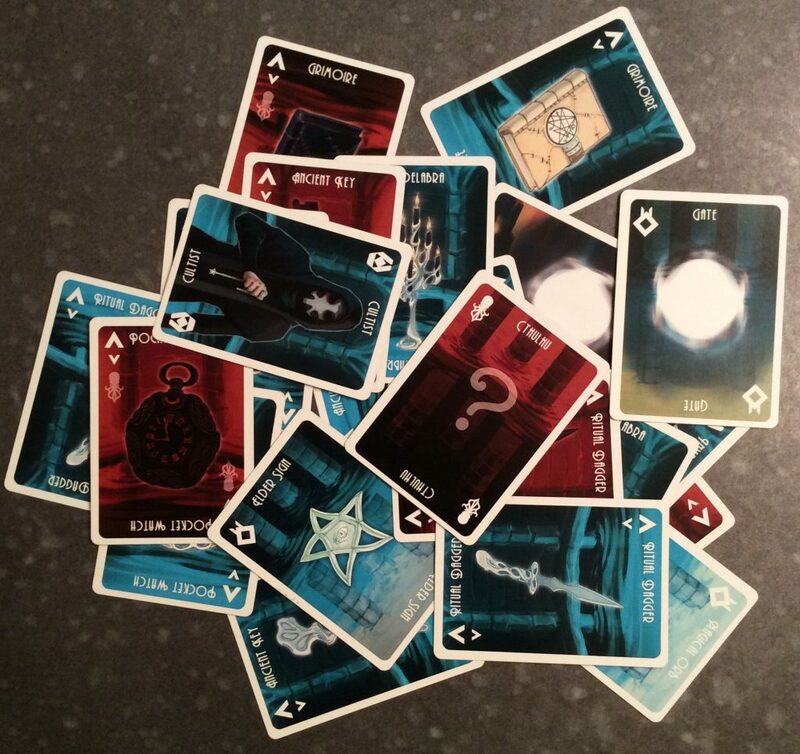 If you hold the Investigator card at the end of the round, you regain one sanity, so that’s good. Magical Orb card. 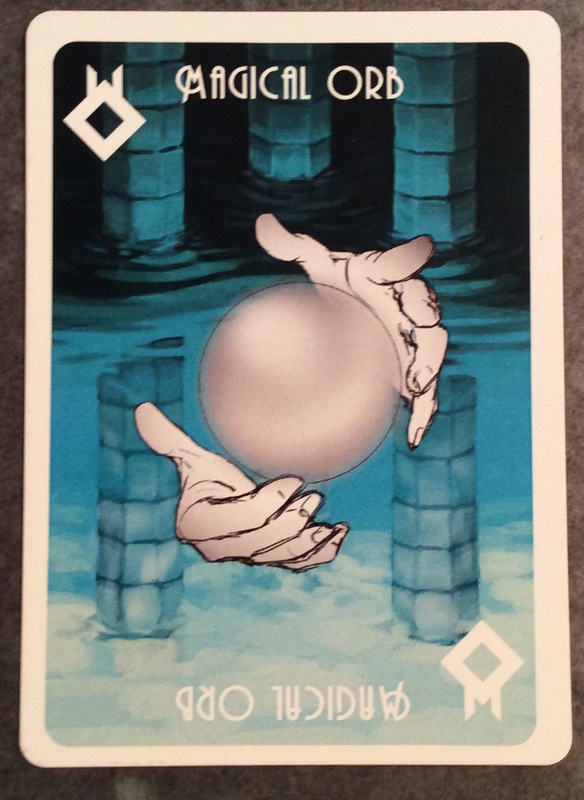 When the Orb card is discarded from someone’s hand, that player gets to look at the top card from the deck and either return it to the top of the deck, or remove it from the round without showing anyone else – again, not a bad card. 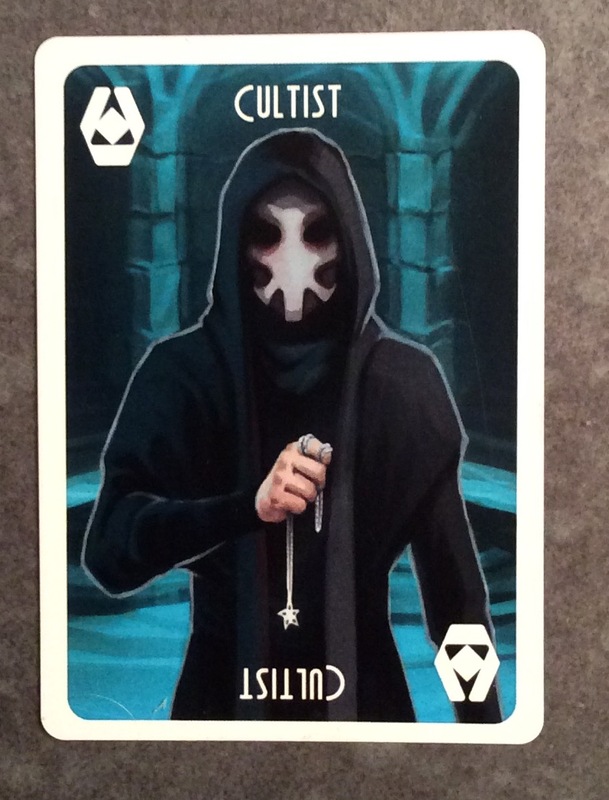 The Cultist card. The Cultist flips the rules, making the blue cards bad and the red cards good. 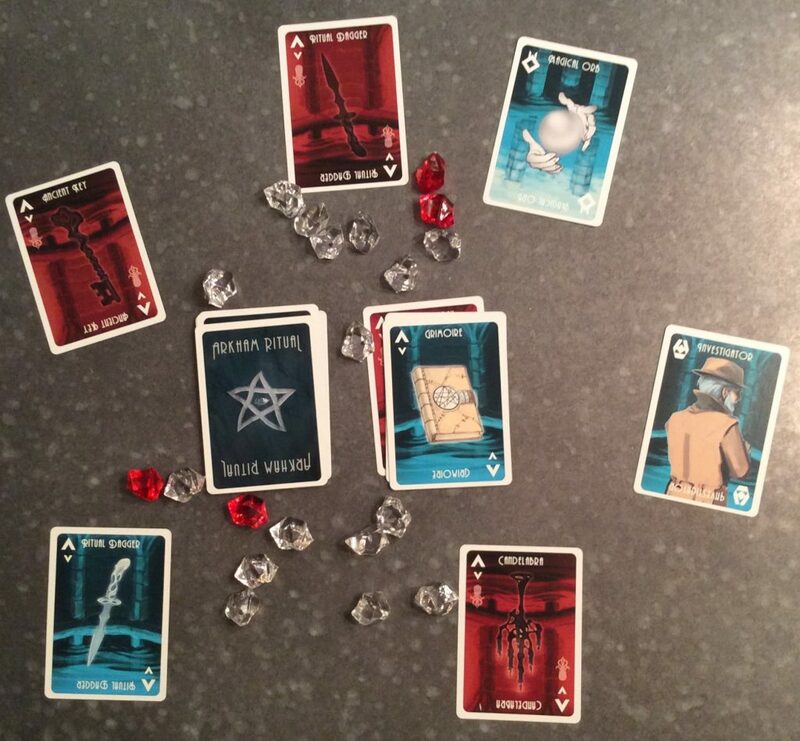 The player with the Cultist card always loses. This card is a fun twist to the game since it changes everything, but if the Cultist is discarded, the rules go back to normal. Elder Sign card. When the Elder Sign is discarded, the round immediately ends. 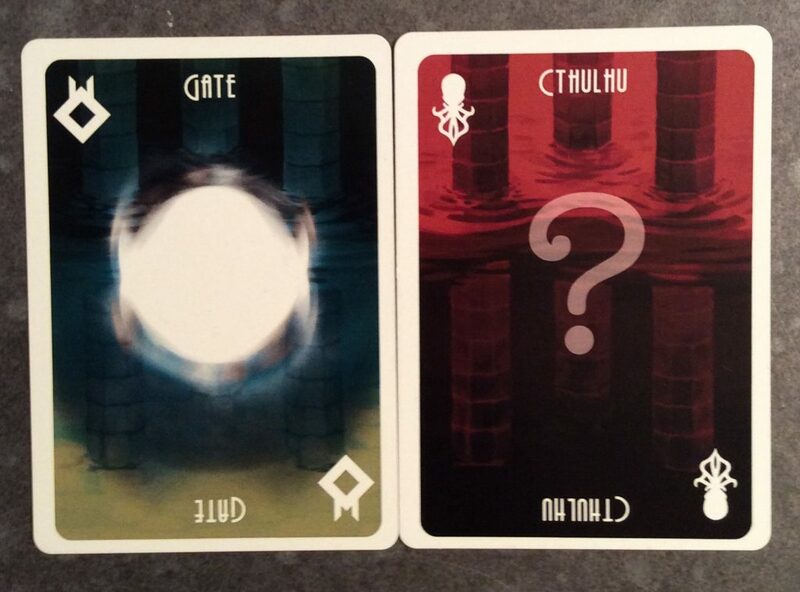 Cthulhu can also show up, and if someone is holding that card in their hand when a Gate card is discarded, the round ends immediately. And, of course bad things happen – bad for everyone but Cthulhu. The holder of the Cthulhu card doesn’t lose sanity, but everyone else loses sanity equal to the number of players minus 1. A round ending this way really impacts the game. If they accept, they take that card into their hand without looking at it, and discard the one that was in their hand. If they refuse to take it, they offer it to someone else who hasn’t been offered or taken a card this round (this is tracked by leaving one hand flat on the table until you have been offered or taken a card this round). Sounds confusing, but it really isn’t. The round ends when everyone refuses to take the offered card, when you run out of cards, or when one of the special cards triggers the end of the round. Honestly when I first read the rules and we setup to play it, I felt like something was missing. That something was the smack talk. Without it, this game can feel a little flat, and the rules don’t actually encourage it, but I do. The official word from the designers was that you can say anything but the card name or color, but several of our games devolved into flat-out lying about the card in someone else’s hand (“No, really, you absolutely have the Cultist!”) and it didn’t detract from the gameplay in the least. There is a lot of referring to the rules – the special cards don’t have any clues on them as to their abilities, so the first couple of rounds may be a little hokey. But the more you play, the more familiar you will be with each card’s ability and the gameplay will move along much more smoothly, plus you won’t give away that you’ve just drawn a card with special abilities by having to check the rules to see what it does. The artwork itself is pretty simple, but you don’t need much to get the feel of the game. 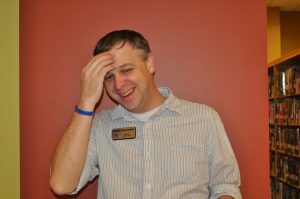 Although I must say I really wanted an image on the Cthulhu card (maybe that’s forthcoming). The rules themselves are a little bit wanting. There is no mention of talking during the rounds (I can’t stress enough how much it adds). Also, the original rules state that you gain “insanity” markers or tokens instead of losing “sanity”. I’m pretty sure they will have fixed this problem, as multiple people expressed a concern about this. The game says it will play 3-7 players, but the 3 and 4 player options require you to play with “dummy” hands, so really it shouldn’t be played unless you have at least 5. The gameplay itself is pretty tight, especially once you get caught up in the smack talk and really get going. There are only 22 cards in the game, so if the round lasts long enough, you really can start to have a pretty good idea what card you have. But even if you never figure it out, it’s still really fun. This is a quick game that can play with higher player counts, which is nice. It also employs a very light Lovecraftian theme without hitting you over the head with it. If that sounds appealing to you at all, you should try it. I mean, where else do you get to join a horrifying Old World ritual where you may or may not make it out alive? 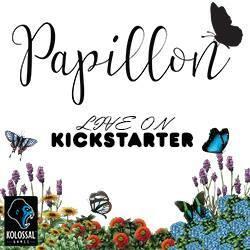 Check it out soon on Kickstarter. 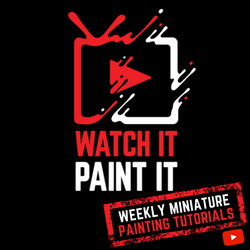 Ninja Star Games provided us with a copy of the game as part of the Everything Board Games Network in exchange for an honest review, which is exactly what we have provided. 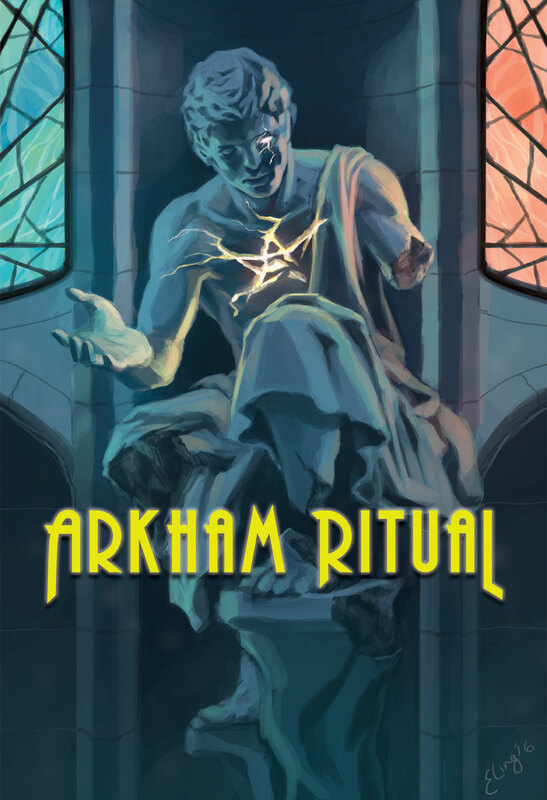 Check out Arkham Ritual on Kickstarter now through March 8, 2017.